Chopperbird Race is the thirteenth level of Donkey Kong Jungle Beat and the first area of the Lemon Kingdom. This level takes place in a forest which greatly resembles Helibird Nest, but set in autumn. 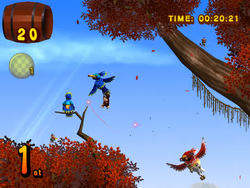 Donkey Kong races a Chopperbird to the end of the level with the aid of Helibirds, and is the first level to have a racing theme. The level is also filled with many pink flowers that blow wind at Donkey Kong's Helibird to speed it up. There are no enemies in this level; the only things to watch out for are the trees themselves, since colliding with them causes Donkey Kong to lose his Helibird, forcing him to obtain another one and making him lose time. Winning the race is not required, but if Donkey Kong wins, he is awarded with 300 beats. This level shares its music with Helibird Dash. The level begins on a flat surface with a Helibird waiting on the branch of a small tree. Once it takes flight with Donkey Kong, it is able to fly between two trees to come up to the starting line for the race against the Chopperbird. When the race begins, the racers make their way northeast towards many pink flowers that help them get a speed boost into the air. The two birds continue north in this race between more tree branches and leaves. The path is wide, but if Donkey Kong happens to move his Helibird into a tree, it disappears. Luckily, many other Helibirds wait on nearby tree branches to help him continue. There are more pink flowers as the birds begin to race northeast again, and they blow air to push the racers up the area. There is a path leading to the north farther ahead of this part, and it has moving tree branches. If the branches are correctly dodged, Donkey Kong and the Helibird can make it to a wide area with the finish line to the right. Right after the finish line is the giant lemon, which Donkey Kong can bite into in order to complete the level. This page was last edited on April 12, 2019, at 13:12.